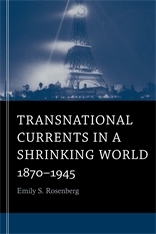 Transnational Currents in a Shrinking World and companion paperbacks by Charles S. Maier, Tony Ballantyne & Antoinette Burton, Dirk Hoerder, and Steven C. Topik & Allen Wells present the essays collected in A World Connecting: 1870–1945, the fifth volume of A History of the World. 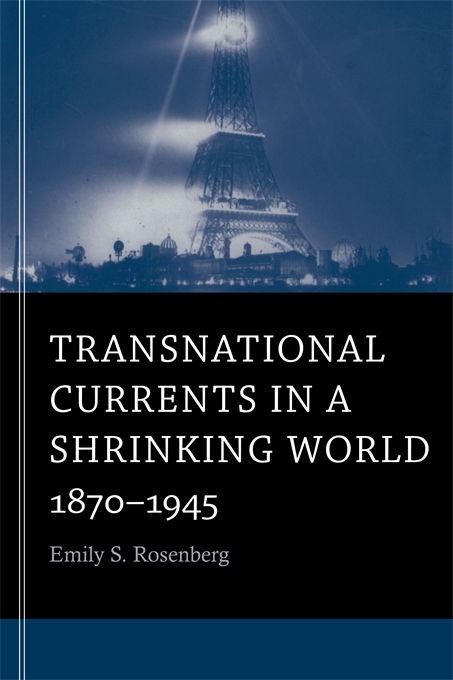 Transnational Currents in a Shrinking World examines the wide variety of social and cultural networks that emerged from the global exchanges of the late-nineteenth and twentieth centuries. Emily Rosenberg shows how transnational connections were being formed many decades before “globalization” became a commonplace term in economic and political discourse. Suggesting crisscrossing flows of power, “currents” provide an especially apt metaphor for transnational exchanges in the age of the telegraph and incandescent light bulb. Rosenberg traces the internationalizing currents that impelled a desire to create global rule-setting institutions, from the Universal Postal Union to the International Olympic Committee to the League of Nations. Other transnational currents coalesced around social networks of class, ethnic, gender, and religious affiliations; around exhibitions such as world fairs, museums, and botanical gardens; around networks of expertise in engineering, medicine, social science, and urban planning; and around mass media and cultures of consumption. Rosenberg suggests that these currents brought a modernity that mixed faith in the rationality of science and technology with a fascination for emotional and spectacle-driven entertainments. In this age of nationalism and imperialism, they both assisted and disrupted ambitions for territorial expansion; they ushered in a new world in which fast-moving technologies of representation brought multiple and shifting codes of meaning. Often overlooked in histories centered on nation-states, transnational currents highlight the irregular patterns of global change and underscore the fluidity of spatial and personal identifications in the period from 1870 to the end of World War II.